HÀ NỘI — Việt Nam’s U20 national team will have a friendly match with U21 Roda JC of the Netherlands during their training camp in Germany to prepare for the upcoming FIFA U20 World Cup in South Korea. This match will take place at Seghemanstraat Stadium in the Netherlands on April 23. The Vietnamese team arrived in Germany on Sunday to begin a two-week training camp. They will play friendly matches with the youth squads of U23 Borussia Monchengladbach and U19 Fortuna 05 Dusseldorf. Schalke 04 cancelled their friendly with Việt Nam so the Việt Nam Football Federation arranged the fixture with Roda JC, who play in the first division in the Netherlands. Việt Nam will meet Borussia Monchengladbach on April 19 in Monchengladbach and Fortuna 05 Dusseldorf on April 26 in Duisburg before returning home on April 28. 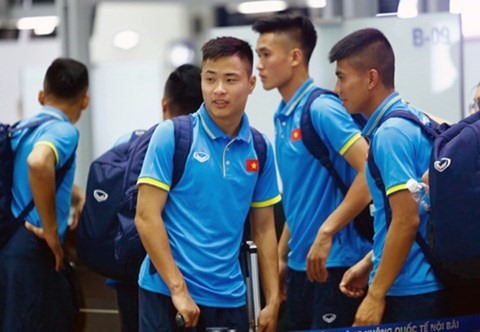 “Việt Nam’s players are very young and it is the first time they take part in the World Cup so the chance to meet leading teams will be a very good experience for them to hone their skills before playing in the World Cup,” said coach Hoàng Anh Tuấn.